Dating back to when her mother, a clerk and later an Executive Secretary at what is now the Administration for Children’s Services, would bring her to the office to help alphabetize paperwork and bring documents to other employees, Tania Cruz has thought of herself as an “ACS child.” Since then, the agency’s child-welfare services stuck with her. “When it was time to go to school, I specifically chose social work because I knew that I wanted to work with children,” said Ms. Cruz, now a 40-year-old Brooklyn resident. She joined the agency as a temporary employee 19 years ago. Once a hiring freeze was lifted, in 2001, she became a permanent worker and rose to eventually become Deputy Director of the ACS’s Central Eligibility Office, where she helps oversee a division that funds the agency’s work. She received the highest honor among eight Isaac Liberman Public Service Awards given Jan. 16 by the Hundred Year Association of New York. 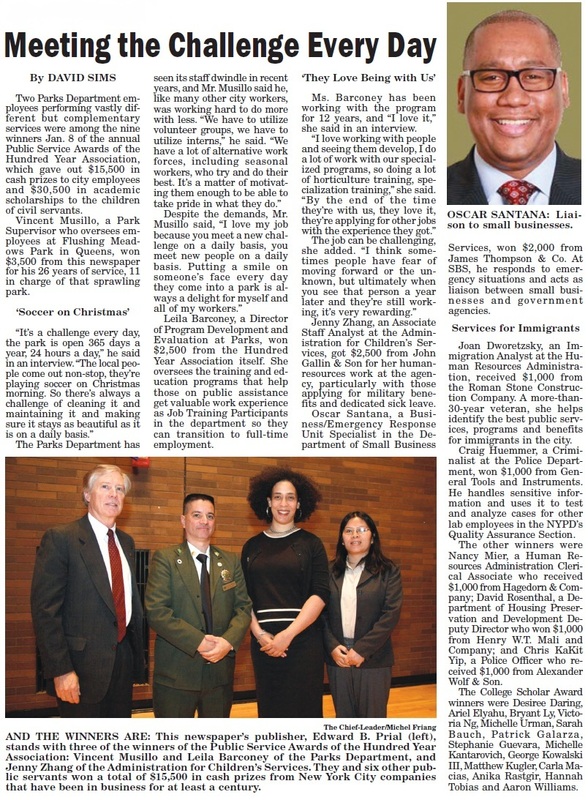 First Deputy Mayor Anthony Shorris spoke during the annual ceremony, which was sponsored by the Department of Citywide Administrative Services and held at One Police Plaza. Ms. Cruz was given $3,500 by THE CHIEF-LEADER, which is one of the member organizations that have existed for more than a century, for her work. Among her accomplishments was ensuring that ACS met requirements for Federal grants, known as Title IV-E, which reimburse the city for half of the money it spends on basic needs for foster children, administrative costs, staff training and recruiting foster parents. She has played a key role in passing three high-stakes Federal audits, and trains analysts outside the agency. The percentage of children for which the agency receives reimbursements rose from 40 percent in 2005 to 60 percent last year, with the added funding allowing ACS to expand services, such as a new foster-care program known as ChildSuccessNYC. Ms. Cruz’s goal is to persuade the Federal government to be more attuned to urban issues. “I feel that when they do legislation, it’s very generic, it applies to the 50 states, but I believe that when it comes to the inner city, they really don’t understand our needs and our wants,” she said. Because the public faces of the agency’s 6,600 employees are those in the field, Ms. Cruz said, she never expected her behind-the-scenes efforts to win her an award. Other award winners included Mohammad Akram, a Traffic Supervisor with the NYPD, who was given $1,000 by Hagedorn & Company. As a nine-year veteran working out of Queens, he tows cars that block traffic. Even while off-duty, he walks through neighborhoods to document missing or broken traffic signs and has filed 500 “traffic-intelligence reports” with the Department of Transportation. Mr. Akram also is a member of his Community Education Council and the NYPD Auxiliary Police, and helps with the City University of New York’s citizenship campaign. Joyce Rivers, a Deputy Human Resources Training Manager and Career Counselor with the Department of Homeless Services, was also honored for her work with several programs, including helping DHS employees locate scholarships and certification opportunities. She volunteers with social-service organizations serving Harlem and won $1,000 from John Gallin & Son, Inc. The other honorees were Richard Chase, an Auto Mechanic in the NYPD, and Antoinette Vereen, a Principal Administrative Associate in the Department of Probation, who won $2,500 from James Thompson & Company and General Hardware, respectively. Also receiving awards were Gregoire Blain, a Fleet Collisions Coordinator in DCAS; Sandra Butler, an Emergency Medical Technician in the FDNY; and Rena Mussington, a Principal Administrative Associate in the DOP, who each won $1,000 from Collegiate Church Corporation, Alexander Wolf & Son and Henry W.T. Mali & Company. The Hundred Year Association and award sponsors also gave out $22,500 in college scholarships to 12 children, many of whom attend schools in New York. Those winners of the E. Virgil Conway awards were Victoria Ng, Bryant Ly, Christine Phelan, Lindsay James Soto, Eva Chen, Anika Rastgir, Tiara Austin, Anthea Chan, Mustafa Gadelrab, Alexis Gray, Melissa K. Liriano and Lesley Ann Santos. 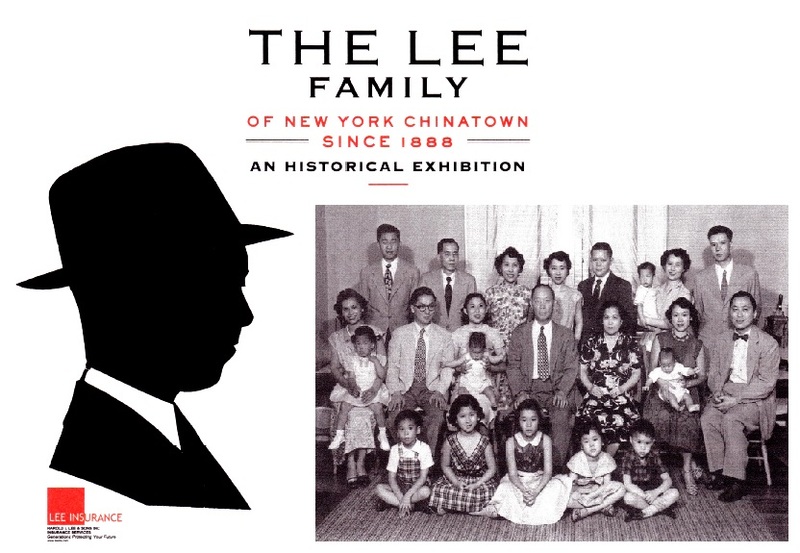 Come celebrate the opening of “The Lee Family,” a historical exhibition at the Museum of Chinese in America. Hosted by the Lee Family and Harold L. Lee & Sons Insurance. The exhibition is presented in an authentic recreated space of an original Chinese business storefront, complete with exquisite tin ceilings. The Lee family has been instrumental in providing artifacts, photographs, and even a rare kinescope of an early CBS television broadcast from 1956. The Lee Family exhibit will run through April 13, 2014. For more information or to reserve tickets click here. The 100 Year awards a membership plaque to the General Society of Mechanics and Tradesmen of the City of New York, commemorating its election to full membership in the Hundred Year Association. Gold Medal Dinner Honoree will be hosting its annual Big Apple Stars Awards this coming November. The Big Apple Stars Awards is designed to recognize extraordinary performance among New York City hotel employees. HANY has more that 270 hotel members. For over 130 years the Hotel Association of New York has supported the hotel community of New York. 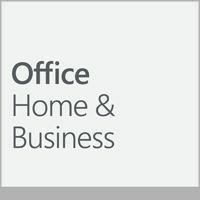 Though is sustainable hospitality committee, which helps implement environmentally conscience initiatives throughout its member hotels and its webinars and networking events, which connects and keeps members abreast with industry trends. The Hundred Year Association who is honoring HANY and its President Joseph Spinnato at its 79th Gold Medal Dinner this year congratulate this year’s Big Apple Awards winners. For RSVP to this year’s 79th Gold Medal Dinner click here. Click here to view article on site. 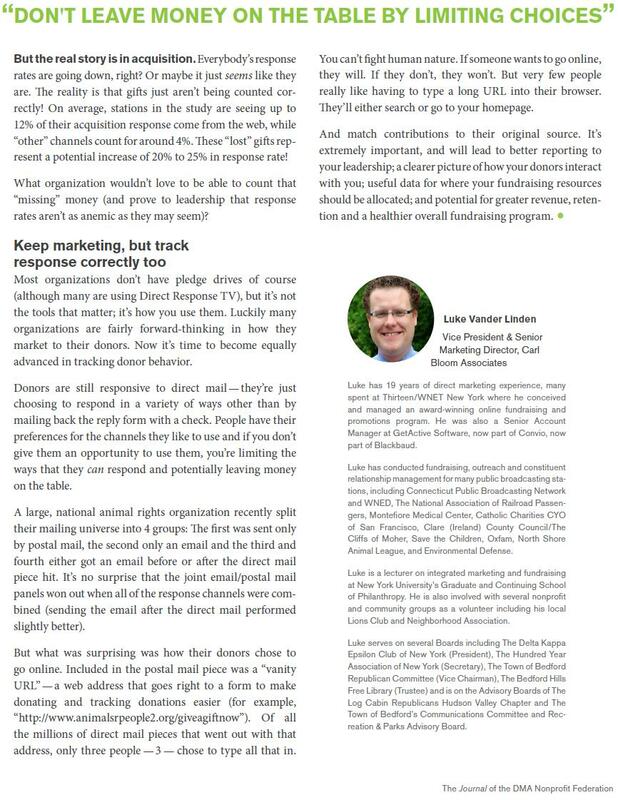 Member Luke Vander Linden Featured in the January Issue of Journal of the DMA Nonprofit Federation. Luke Vander Linden, Vice President & Senior Marketing Director of Carl Bloom Associates, talks about donor behavior and the management of nonprofit organizations. To read the full article click on the in link below. Public Service Award Winners Talk About Facing Daily Challenges and HelpingTheir City. Article originally published in The Chief-Leader. Deputy Mayor Holloway and DCAS Commissioner Handy joined The Hundred Year Association of New York to honor 9 outstanding civil servants and 15 academically talented children of City employees who received $15,500 in cash awards and $30,500 in college scholarships from the Association’s members. —Century-Old Private Firms Thank City Employees and Give College Scholarships—Deputy Mayor Caswell Holloway and Department of Citywide Administrative ServicesCommissioner Edna Wells Handy today joined representatives of the Hundred YearAssociation of New York to honor 9 outstanding civil servants and 15 academically talented children of City employees, who received $15,500 in cash awards and $30,500 in college scholarships from the Association’s members. Joining Commissioner Handy for the awards ceremony at Police Department headquarters were representatives of the Hundred Year Association and its 200 member organizations. 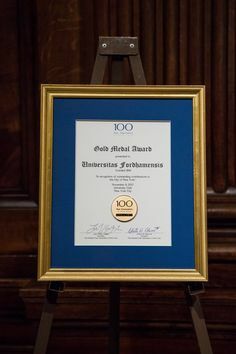 “On behalf of the Board of Governors and members of the Association we thank Mayor Bloomberg, Commissioner Wells Handy and her staff for their assistance in supporting and organizing this unique Public / Private Program, created to recognize and reward outstanding achievement in the workplace and in the classroom,” said Clinton W. Blume, III –President of The Hundred Year Association of New York. The largest scholarship, in the amount of $6,000 sponsored by STV Group, went to Desiree Daring, a senior at Williams College and a graduate of Brooklyn Technical High School. She is the daughter of Eleston Daring, who is a School Safety Engineer at the Department of Transportation. 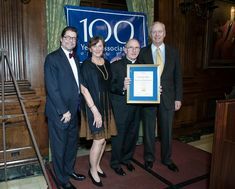 Founded in 1927, the Hundred Year Association of New York celebrates the business, professional, educational, religious and charitable organizations of New York City that are at least one hundred years old. Since 1958, the Association has highlighted the close partnership between the City’s private sector and City government by recognizing outstanding career civil service employees. 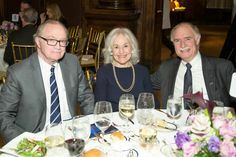 Named for the Association’s founder, the Isaac Liberman Public Service Awards are available to employees whose salaries do not exceed $81,000. Individual cash awards generally range from $1,000 to $6,000. 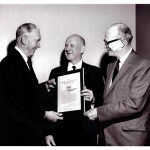 The Association’s E. Virgil Conway College Scholar Awards Program was founded in 1971 to assistacademically qualified children of career civil service employees to obtain college educations. College Scholar Awards are granted to promising students whose gross family incomes do not exceed $110,000. The scholarships recognize excellence in scholastic achievement and community service. College scholarships range from $1,000 to $6,000. A complete listing of this year’s 24 winners is available at the DCAS website. McRoberts Maritime Security was recently awarded the contact to write the Port Facility Security Assessment and Plan for the new Kai Tak Cruise Terminal in Hong Kong. This two-berth cruise terminal, which is currently under construction, is being brought to China by World Cruise Terminals, a consortium made up of partners Worldwide Flight Services, Royal Caribbean Cruises Ltd. and Shun Tak Holdings Limited. Located in the heart of Hong Kong on Victoria Harbour, this cruise terminal will offer panoramic views of the famous Hong Kong skyline and is within miles of downtown. Nick Knittel, Senior V.P., and Mike Lee, V.P., will execute the consulting contract on behalf OF McRoberts Maritime Security. The Kai Tak Criuse Terminal is set to accept its first cruise ship , Royal Caribbean’s Mariner of the Seas in June 2013 and will be able to clear 3,00 passengers per hour. 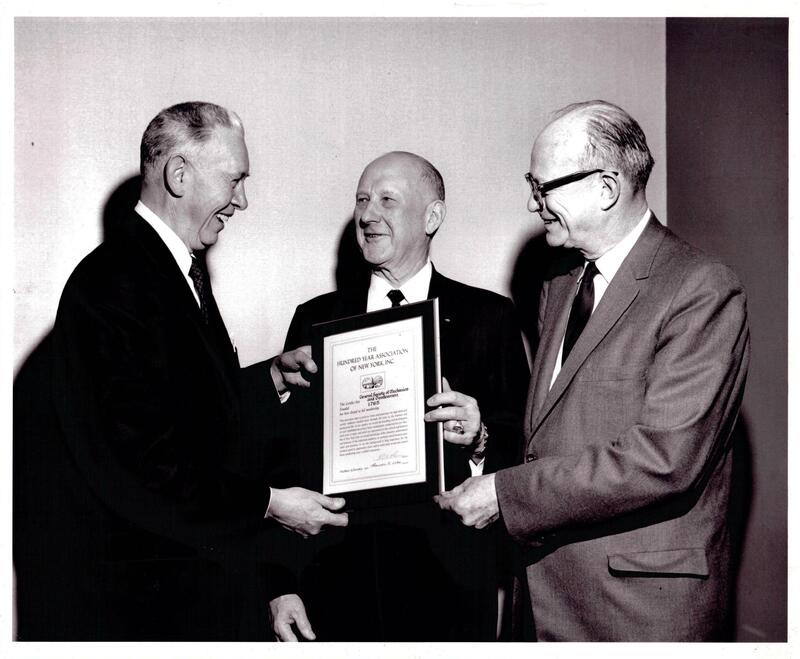 Founding in 1876, the McRoberts Protective Agency, Inc., is a privately-held, full-service security provider with national scope. A nationally certified WBE (Woman Business Enterprise), McRoberts is the oldest security agency in America and today provides comprehensive, customized and integrated security services, technology, consulting, investigations, and training. McRoberts Maritime Security is the operating division of McRoberts that leads the maritime security industry in the area of regulatory compliant, integrated security solutions for port facilities, cruise lines, cargo ships, and cargo terminals. Today discerning clients in a number of different industries from coast to coast recognize the value that McRoberts can add to their security programs.